I met with the participants in the first Theatrical Interpreting Preparation Series workshop on Saturday, December 1st. It's a diverse and wonderful group of interpreters and I'm looking forward to our time together over the next four months. 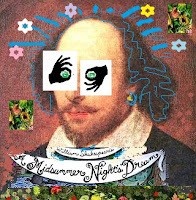 This coming Thursday they will be attending "A Midsummer Night's Dream" at PCS. I didn't give them a lot of homework, but a few things to look for which relate to our meeting on Saturday while they're watching the play. Then when we meet again in two weeks we will talk about those observations and wrap up that topic and begin the next one. I've rented a conference room at The Armory from Portland Center Stage and it's nice to be in a theatrical setting for this workshop. The room is comfortable and access is easy for pretty much whatever we need. This is a great group for my first run of the theatrical interpreting workshops I have planned. Don't worry if you missed it this round - I will be doing it again next season. And I have other performance interpreting workshops in the development process, as well. For now - a lovely first gathering! In other news, I wrote another blog post go out for Portland Center Stage and it went out last Friday - posted by the amazing Katie O. You can read the post by clicking on my Bard collage below (I had fun making this digital collage for the post).